All great legends have some amazing tools that helped them achieve success. So, what tools do you have up your sleeve? If your palms are starting to sweat and your mind is drawing a blank, fear not: Bonanza has some pretty awesome tools to help every seller live their best lives. Each tool we have to offer is distinctly unique and can benefit your booth in a number of ways. Let’s get started! The Background Burner is unique among similar tools because it removes the background automatically, with little to no effort on your part. Unlike other background removal programs, you don’t need to learn any software to use it. It is simple, easy, and pays off exponentially. Buyers are more likely to buy your products if they have a clean, white background. Case studies show that removing the background using a tool like Background Burner can increase sales conversion by 300%. Giving your images a crisp, white background will also give a professional and uniform look to your booth. The great thing about Background Burner is that there is no human intervention needed - you don’t have to learn any new software. Simply upload an image and then download the result with the background removed. If you want to alter the image after it’s been processed, there are a few user-friendly tools that you can use to adjust the final image. Bonanza's advertising platform publishes your items on shopping sites all across the internet to get maximum traffic to your booth. It's the main reason our sellers reach more shoppers than most any other selling platform. You tell us how much you can afford when your item sells, and our computers go to work making bids on your behalf to get your item in front of every possible buyer. Taking advantage of Bonanza’s advertising program is a no-brainer because, unlike other selling platforms, Bonanza has no listing fees or upfront advertising costs. You won’t be charged an advertising fee until your item sells - and since you get to choose the percentage you pay for your items to sell, you can easily build that cost into the listing price of your item. You won't necessarily be charged the full percentage -simply set the maximum percentage allowed, and we charge less whenever possible. We never exceed your maximum commission. To sign up for our advertising program, hover your mouse over the "Selling" link in the upper left hand corner of any page. From there, select “Advertise items” from the drop down menu. You can choose your preferred maximum commission percentage (the Final Value Fee you pay for advertising) and see which websites will show your items for that price. TurboTraffic is a specialized service that drives maximum buyer traffic to sellers who are enrolled as Platinum or Titan members, or for sellers who purchase a TurboTraffic Pack. TurboTraffic works together with Bonanza's advertising program, using the ad platforms you've selected to get maximum exposure for your store. We typically see a 300% increase in daily pageviews for merchants receiving TurboTraffic. The impact of TurboTraffic will vary from seller to seller, depending on their price point and the type of merchandise sold. Membership level. Platinum members can get up to 7 days per month of TurboTraffic, whereas Titan members can get up to 25 days/month. Advertising commission level. The higher the advertising commission level, the longer we can send TurboTraffic to your booth. Conversion rate. Stores with conversion rates above 1% will enjoy longer TurboTraffic runs. Overall traffic volume. The more clicks you get, the more it costs us to acquire the traffic for you. So if your store is getting thousands of clicks per day, the TurboTraffic duration will often be shorter than a smaller store. Opening a Webstore gives you the control to build your own, branded online ecommerce store, separate from the Bonanza marketplace. With Webstores, you get a beautiful, professional-looking online store, complete with your own custom domain name, a secure shopping cart, and a variety of customizable themes to choose from. Having a Webstore gives you double the opportunities to spread the word about your products. Other Webstore options use difficult customization tools or require coding knowledge. 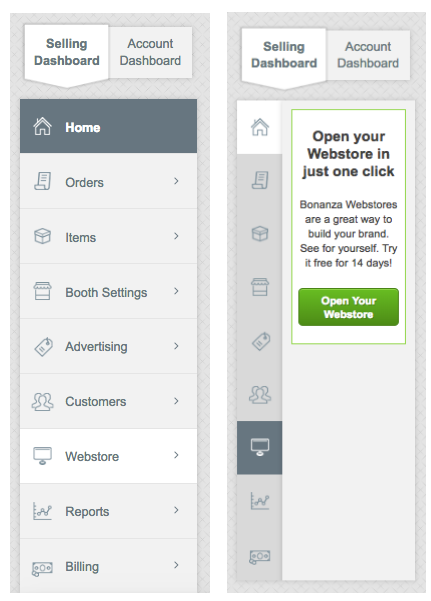 With Bonanza Webstores, you can customize the look of your store without learning to code. Just point and click to choose your theme, layout, and pages. We offer multiple pre-built templates to match the look of your products so you can change templates instantly and flawlessly at any time. #protip: Check out our test Webstore, Green Bee Decor, to test all of our themes and see exactly what a Webstore looks like with all the bells and whistles! Activating your Webstore couldn’t be easier. When you log into Bonanza, click the "Selling” link located in the upper-left corner of any page to get to your “Selling Dashboard”. Selecting “Webstore” from the grey tabs on the left will allow you to choose between a monthly or a yearly subscription; both of which come with a free domain name. Once you activate your Webstore, you can make edits from the Selling dashboard or preview your Webstore and make edits directly on the page. For more tips on customization, check out this article about Webstore customization. #protip: Publish your Webstore listings to Google Shopping via the Webstore Broadcaster, where you can easily create Google Shopping ads for your Webstore products without needing to have an in-depth knowledge of Google's advertising platform. The booth Batch Editor lets you edit groups of items in bunches, rather than having to manually edit items one at a time. It is the best tool for managing your inventory when you have more than a few items. For example, if you want to offer free shipping, apply a discount percentage, or reserve items for a buyer, you can apply these changes to your items in bulk using the Batch Editor. Three words: It saves time. A lot of time. Whether you have 5, 50, or 500 items in your booth, editing your items one at a time is tedious. Batch Editor can change basically any item trait you need to edit, which makes organizing your items infinitely easier. There are a few ways you can access the Batch Editor. The first is to hover over the “Selling” link located in the upper-left corner of any page and select the “Batch edit items” link from the drop-down menu. 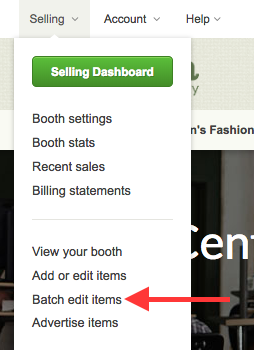 You can also click on the grey “Items” tab in your “Selling Dashboard” and select “Batch Edit"
There are categories on the left side of the editor that allow you to make several different types of changes. For more specific details, check out this help article. The Inventory Sync will grab all of your active listings from eBay, Amazon, Shopify, Etsy or a CSV file and copy them into your Bonanza booth, with as much detail as it can gather (title, description, price, shipping information, pictures, and category are all usually grabbed, with some exceptions). It also runs an automatic sync that imports new listings that have been posted on eBay or Amazon and removes any items sold on eBay or Amazon. We understand that many sellers choose to sell on multiple websites, including the platforms you can import your items from on Bonanza. That’s why we developed the Inventory Sync: to help you maintain consistency across the sites you use to sell your items. Running a successful online business means you don’t have time for busywork like adding and removing listings on each individual site. To use the Inventory Sync, hover your mouse cursor over the "Selling" link located on the upper left side of each page, just above the Bonanza logo. From there, select the platform you wish to import from from the drop down menu. From there, you can select from Import Options (and Advanced Import Options) and choose the settings that are right for you. 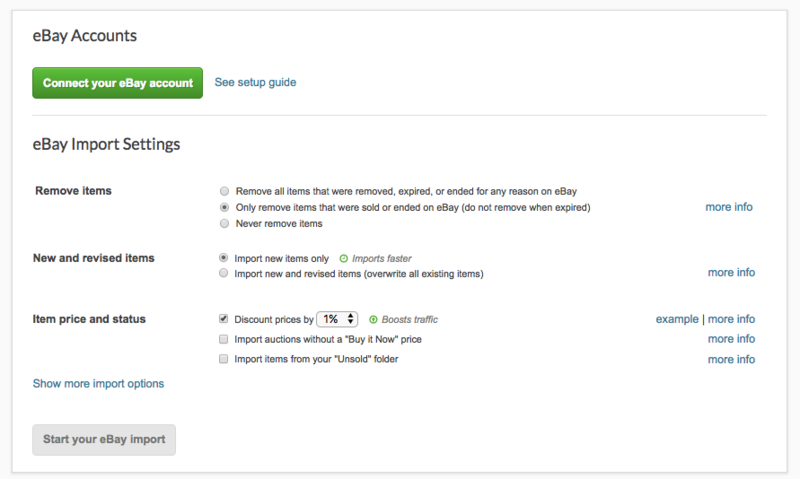 Once you click the green button to “Import Items,” your inventory will automatically sync. 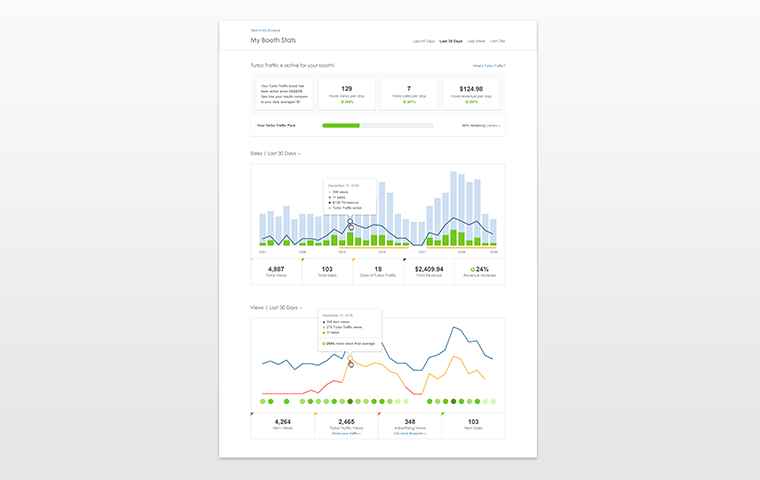 The stats dashboard is designed to encourage Bonanza sellers to use beautifully-presented data to gain deep insights into the habits of your shoppers, as well as better understand traffic and revenue trends for your booth or Webstore. Savvy sellers should use the stats dashboard as a not-so-secret weapon to maximize the impact of your Bonanza listings. Visit your stats page frequently and identify opportunities to take full advantage of your advertising spend, optimize your listings for search, and track your most popular items - or see which items aren’t getting much love from shoppers. 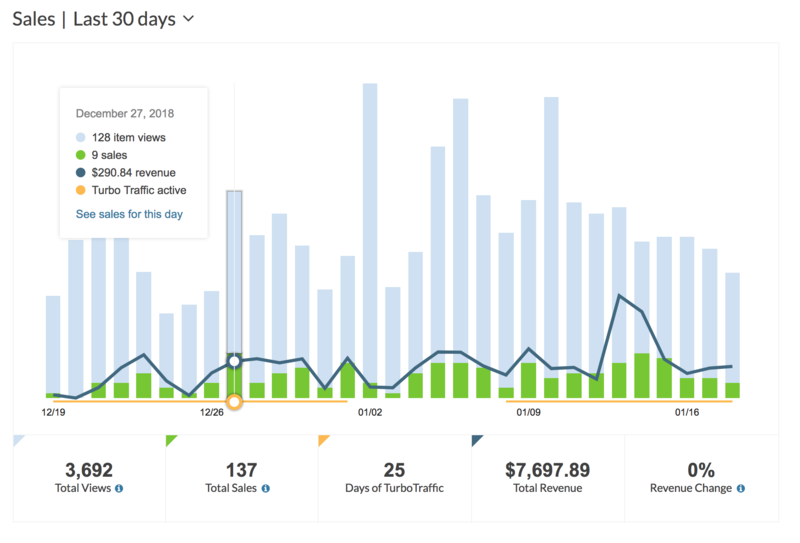 There’s so much to say about the multitude of uses for your stats page that we’ve written a whole article to make sure you take advantage of everything this tool has to offer. Now that you know about these great Bonanza tools, you’ve got a utility belt that could rival Batman’s. It’s packed to the brim with secret weapons that can make you an unstoppable force in the ecommerce world.